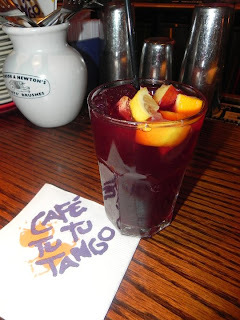 Cafe Tu Tu Tango in Orlando, Fla. has great food, amazing sangria, excellent customer service and a wonderful atmosphere. 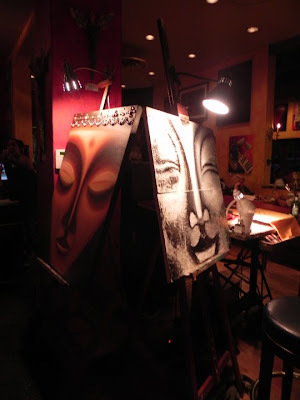 What really separates this restaurant from your typical one is that it’s also an artist’s space. 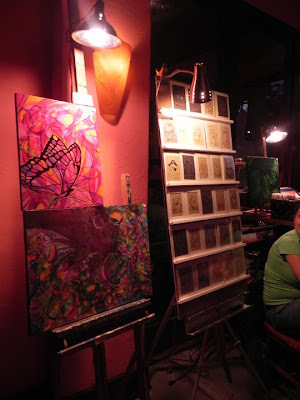 There are artists creating images all around you while you are eating and drinking, and almost all the art on the walls is for sale. Oh, and did I mention they also have free WiFi?! 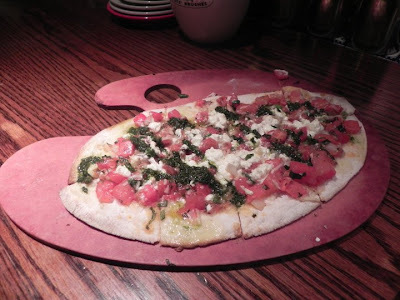 The restaurant was located behind my hotel, and since I needed to get some work done, I figured I would have a small bite to eat and a drink before heading over to Universal’s City Walk for a night of live music. Well, I never made it over to Universal. The atmosphere, friendliness and well-made sangria was enough to keep me there all night. Their sangria is made, and housed, in the large silver looking barrel you see to the left. So, no matter what bartender pours it for you, you always get the same great taste. It’s a little on the tart side, which I love, and doesn’t have a strong alcohol flavor, which makes the sangria go down easy — really easy. 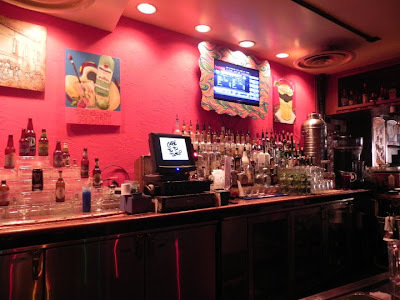 The menu is just as diverse as the colors inside the restaurant, and has everything from gator bites and cayo hueso wings to prosciutto and mango flatbread and macadamia crusted mahi mahi skewers. 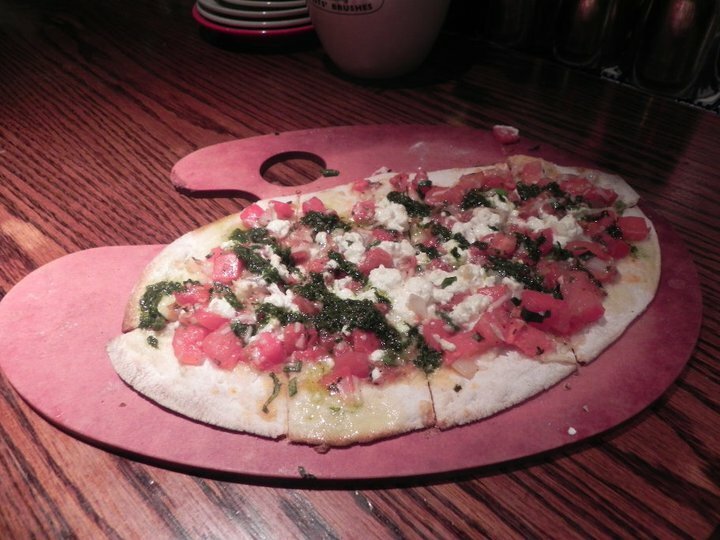 I picked the roma tomato and goat cheese flatbread, which their menu describes as “shredded parmesan, roma tomato compote, goat cheese and basil oil.” It was de-lish! The basil oil was so impressive. It was almost like a pesto, but had more of an olive oil consistency. Keeping with the restaurant’s theme, it was served on a large artist’s pallet. Their prices were moderate, and not too expensive either. I definitely spent less than I would have at another chain-type restaurant and had way better food and drinks. 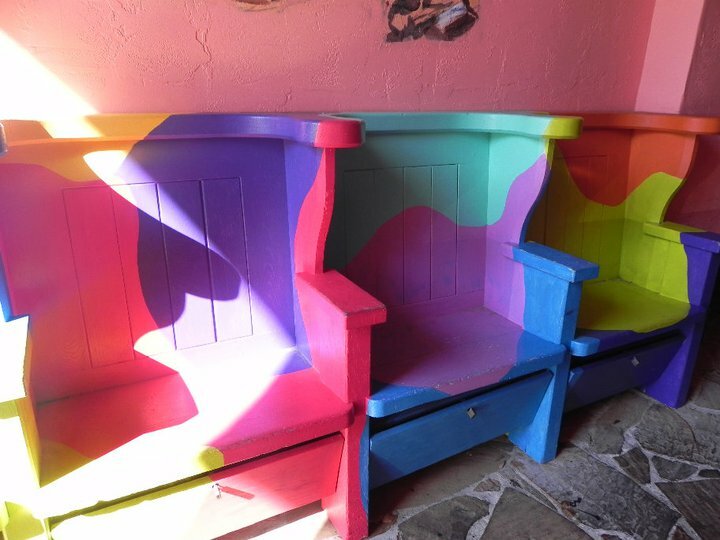 There is art everywhere you look, from the walls and the benches outside, to the artist in the hallway leading into the cafe and also on the outside of the building. I actually purchased a piece of art from the photos above. 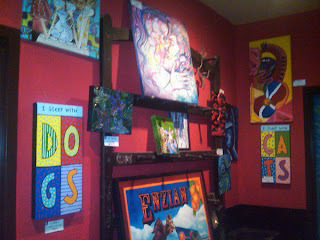 It was nice to see something you like, purchase it and also support a local artist. Something that can hang in my house to remind me of my trip is a much better souvenir than a t-shirt. This place is a must stop for anyone visiting Orlando, and is looking for a unique dining experience. For more pictures from our visit to Cafe Tu Tu Tango, visit our Facebook page. Great review, and I love the photos! Wish I had known about it last year when I was there for Photoshop World. Looks like an awesome place to relax and enjoy some great food. I will put it on my list of restaurants to visit. 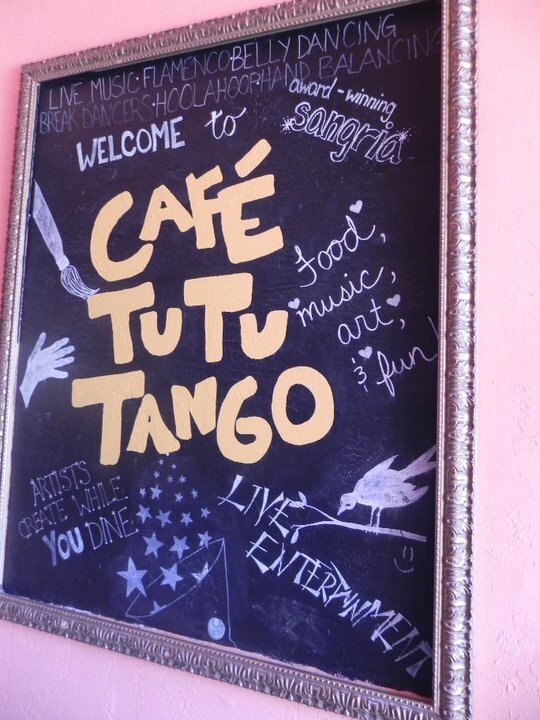 Love the art..Cafe Tu Tu sounds like a great Orlando restaurant..if I ever get to Orlando, I'll have to check it out. I am going to Sarasota in a few months, but that is still about a 1.75 hr drive. Great place here,,with a lot of drinks huh! Wonderful place , I really like to go to some bars where I can drink and eat delicious food !! excellent recommendation !